Using cuddletunes, you can easily and quickly create a personalized "soundtrack" for your child to fall asleep to every night. Our soundtracks have beautiful music plus something special -- your own voice reading a story or singing a song to your special little one! 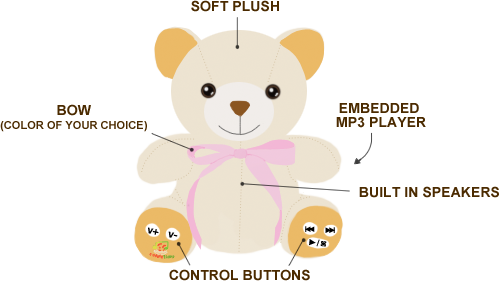 Once your soundtrack is created, you can play it for free from our web site, buy the soundtrack as an MP3, or get it pre-loaded onto one of our adorable kids music players. Having your voice on the soundtrack makes it extra special for your child and really helps to foster a closer relationship when you can't be there. Whether you are half way around the world or just in the next room, your child will love drifting off to sleep while hearing your voice every night.